You can listen to 'Mr. Dickhead' here. The spirit of The Outsiders is spreading over The Netherlands. The Dutch band that scored hits in the years 1966-1967 and almost all very good is famous with garage rock fans from all over the world. And now a band of Dutch youngster that could be grandchildren of Wally Tax c.s. has released an EP that emulates the atmosphere of Outsiders' records like it's 1968. Sam Vermeulen throws his lyrics into the world with abandon and the same dashing sneer as Wally Tax had back then. Luckily it's not all music for old geezers. Next to an undertone of punkrock there's a The Libertines element in several songs, the 'we are playing songs here, but see if we care, but in the mean time we are incredibly good' element. The enthusiasm of Arctic Monkeys in its "Dancehall days" is in there without the riff meistering. Palio Superspeed Donkey is a group of extreme youngsters from Amsterdam that is taking alternative pop Holland by storm. TV, live radio, shows, it's all there. And quite rightly so. The youthful enthusiasm definitely shines through in several songs on Wateramp, meaning that perhaps technically not everything is the best I've ever heard. Some breaks are even a bit rusty sounding, but who cares when so much fun is going around as on this EP. There's time enough to get better when someone is only 15 or 16 years old. There are no guarantees, but if someone is this good at thatage, what's in store for the world? 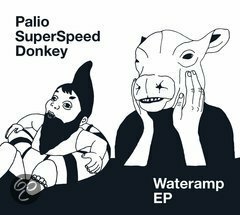 Palio Superspeed Donkey offers bare music. Basically what you see is what you get. There may be a vocal overdub, but the drums, bass, guitar sound is basically it. The sound is dry, not a lot of twiddling with effects has taken place in the production process. Recorded may be a better description. A sound that fits the music on the brink of (brit)pop and indierock. Mr. Dickhead rocks out (with a very teenage video), with a "Oops, I've said it again" Britney quote in the lyrics. Wateramp EP is over before you know it, but it also over so fast because I'm really enjoying myself. 'Reflection of my thoughts' is the best song the Barat-Doherty tandem has never written. It has this driving force with the singer holding back, which gives a special effect to the song. The Libertines are dead, long live Palio Superspeed Donkey! When the band ends Wateramp with 'The homeless' where they prove to be able to go one level deeper than any of the songs before that, I'm convinced that I've been listening to the future. Palio Superspeed Donkey is a band to watch.